We are sold out of advance tickets for this show. Some standing room only tickets may be available at door time for $30.50. The band formed in 2000 for a one-night gig, and everyone enjoyed playing together so much – and the audience reaction was so enthusiastic – that the band stayed together. 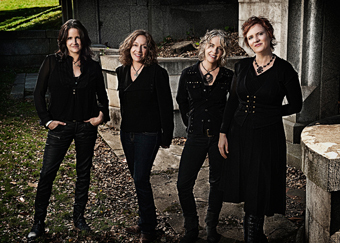 Since then, they’ve released seven albums, including their latest, Live at KVIE Studios, Volume I. Pam Delgado plays percussion and guitar, Renee Harcourt plays guitar, bass, banjo, and harmonica, Jeri Jones plays guitar, bass, dobro, and mandolin, Monica Pasqual plays piano, accordion, and melodica, and they all sing – beautifully! Plus, they know how to tell a good story and make the audience feel like part of the show.